With limited number of new launches across the city, Delhi’s capital market continued to remain lacklustre in the first quarter of 2016. A few localities fared well on the capital growth index, majorly owing to over-ambitious ‘ask’ rates by sellers. One such locality, Dilshad Garden, noted a capital hike of five per cent QoQ. The locality could have benefitted from the initial signs of the long-pending metro in the form of the first girder on the Dilshad Garden-Ghaziabad metro route. Despite huge supply pipeline, some sectors in Dwarka - sector 14, 12 and 7, witnessed quarterly increase in capital values to the tune of 2-3 per cent each. With Dwarka Expressway expected to see speedy completion after being accorded a highway status, most residents of Dwarka are planning to shift in proximity to Gurgaon. While values of builder floors remained stable overall, some posh addresses including Hauz Khas and Sarvpriya Vihar witnessed an average rise of four per cent QoQ. This uptrend can be attributed to an active end-user market. A few redevelopment projects in Greater Kailash commanded a premium over the existing market rates, majorly owing to newly built configurations and amenities like green space, exclusive car parking and home refurbishments. GK II and III thereby registered a quarterly growth of three per cent, each leading the otherwise stagnant market of Delhi. Popular among mid-income segment home buyers, Shahdara registered a five per cent growth in the values of builder floors. Promise of respite from bottlenecks during peak traffic hours due to widening of two bridges could have led to this. Some localities that individually held the baton of prospering rental charts included sector 10 and sector 11 in Dwarka - clocking a rental rise of seven per cent each YoY. 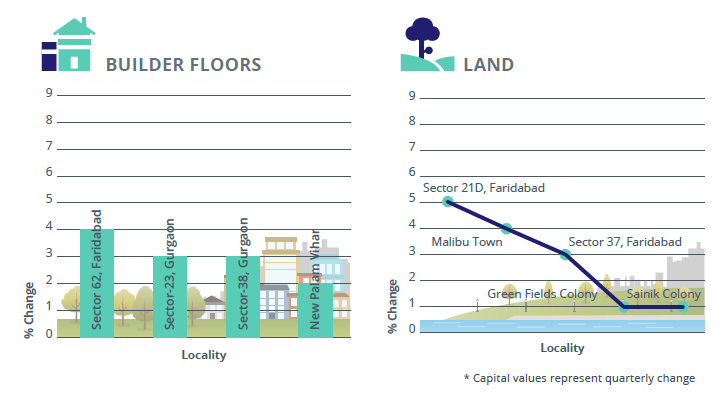 Apart from proximity to metro stations, these sectors owe their growth in the rental space to a proposed financial hub in the vicinity and comparative affordability to neighbouring zones. The inauguration of the elevated metro route between Jahangirpuri and Badli played a pivotal role in bringing positive rental sentiment in Rohini. Rents here witnessed a surge of five per cent YoY. Rents of builder floors in West, North and Dwarka fell by an average of three per cent in Jan-Mar 2016 as against the same quarter last year. South Delhi witnessed rental rates of builder floors succumbing to pressure created by the popularity of society apartments, which offer better amenities and a secure environment. Nevertheless, boasting of the highest concentration of builder floor units in the capital city, 90 per cent of the localities that performed well on rental charts in the last one year belonged to South Delhi. 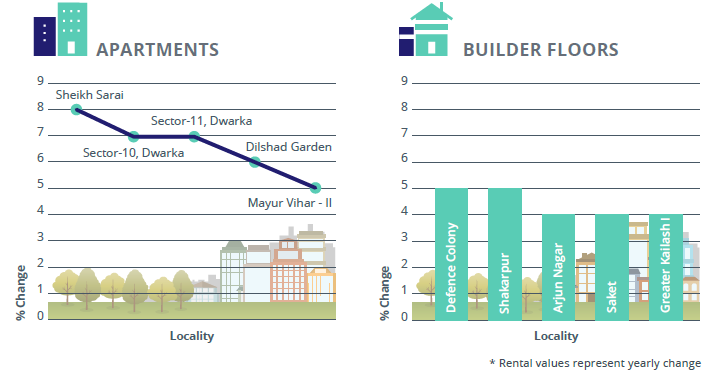 Cosmetic renovations and high reputation index helped localities such as Defence Colony, Saket and Greater Kailash I and II, Green Park and Malviya Nagar note a rise of 4-5 per cent in the rents of builder floors YoY. While only a handful of projects were launched in Noida in the first quarter of 2016, the zone still leads the race with around 1 lakh unsold housing units. The huge pile up of inventory has continued to put pressure on capital values here. Infrastructure upgrades like expansion of the metro network to Greater Noida, and comparative affordability to Gurgaon are the factors still working in favour of Noida and Greater Noida. Though the overall capital market posted a decline, projects deliveries in sector 79 Noida helped it score a five per cent quarterly growth in property values. Society apartments in the sector are priced around Rs 5300 per sq ft.
A few sectors across Noida-Greater Noida Expressway such as sectors 131 and 143, witnessed a price rise of three per cent each in the last two quarters. 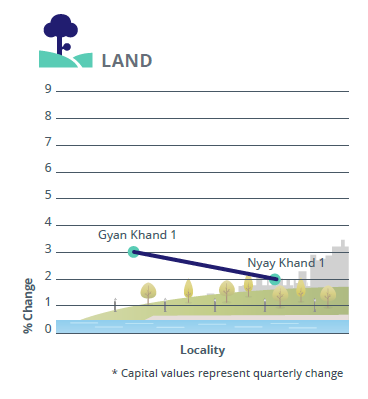 While the value of land parcels in Noida dipped insignificantly, plots in Greater Noida held on to their capital rates in Jan-Mar 2016 owing to the upcoming metro connectivity. 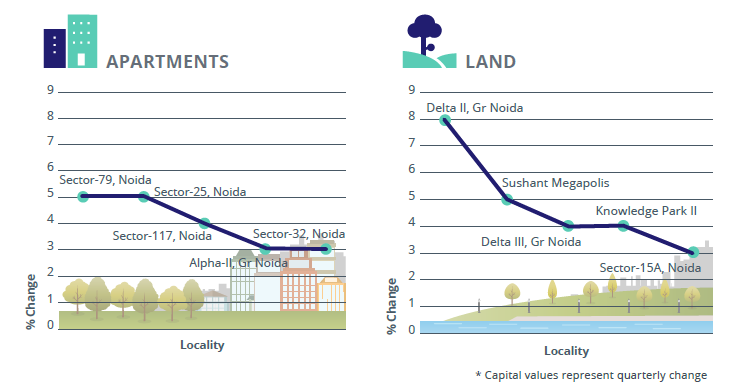 The promise of improved connectivity boosted realty sentiments in certain pockets of Greater Noida, especially Delta II and III, and Knowledge Park, which witnessed an average price surge of five per cent in land values, cumulatively. Noida’s affluent Sector 15A posted a hike of three per cent in average values of residential plots. Hike in circle rates for various categories, including residential land, could have played a role here. The growth of five per cent in the prices of residential land in Sushant Megapolis is believed to be the result of a higher ‘ask’ rates by ambitious sellers, anticipating greater demand in the near future. With the prodigious demand-supply gap, the rental sentiment in Noida remained passive. Rents of apartments in Noida declined by an average of three per cent between Jan-Mar 2016 and 2015. The highest gainer, Sector 78, Noida, where rents rose by eight per cent, YoY, witnessed possession of a few projects in the recent past. Despite the lack of infrastructure and civic amenities, several homeowners moved into their apartments to escape the twin burden of paying rent and EMI, thereby propelling rates. Furthermore, the Noida Authority earmarked Sector 78, among other localities, as a part of its endeavour to develop 35 parks in 2016. Sector 47, Noida attributes its yearly rental growth of seven per cent to its high occupancy rates and ornamental attractiveness. 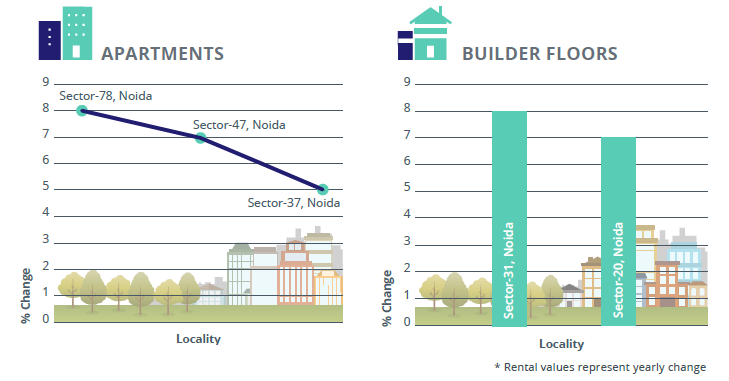 Although rates of builder floors in Noida plateaued YoY, rental markets of sectors 20 and 31 performed well. Sector 20 and 31are strategically situated in proximity to medical care centres, replete with malls and groceries, and at a convenient distance from sector 18 and Noida City Centre metro stations. However, the surge in rates can be a result of specific lucrative deals and do not necessarily reflect the overall market sentiment for this property type. 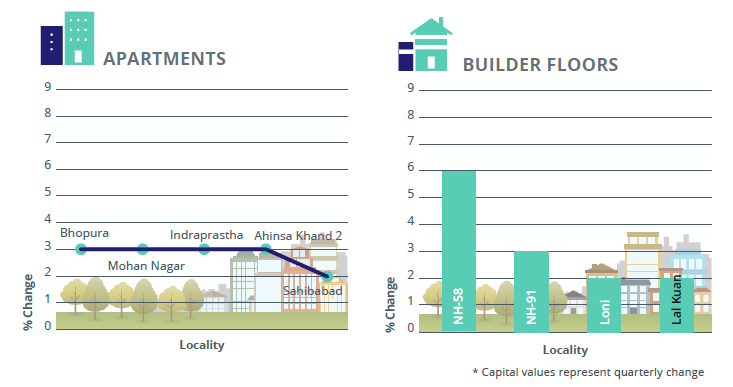 Although sectors 26 and 41 enjoy the same infrastructural and civic advantages as sectors 20 and 31, the rental rates in there two localities plateaued as a result of price saturation. A couple of localities such as sectors 27 and 49 posted a decline in yearly rentals due to oversupply. With around 40,000 unsold housing units, Ghaziabad accounts for about 20 per cent of the total unsold inventory in NCR. Capital market here posted no growth in the last two quarters. Civic issues including power outages and inadequate roads contributed to the subdued market. Ground water depletion by 7.25 meters in certain pockets of Ghaziabad is another cause of worry for the city’s realty. While Bhopura and Mohan Nagar registered an average capital growth of three per cent each, new registrations in both these localities have dipped, signifying a depleting buyer base and low sales volume. Ahinsa Khand in Indirapuram, however, continues to be a favourite among buyers due to its proximity to the commercial hub of Noida Sector 62, posting a growth of three per cent QoQ. The average value of builder floors declined by two per cent, delineating a lack of preference for this property type as opposed to society apartments. Owing to its strategic location and comparative affordability, prices of builder floors in Ahinsa Khand II, Nyay Khand I and Gyan Khand I – all located in Indirapuram, rose by three, two per cent and three per cent, respectively. Builder floors within Rs 30-40 lakh saw maximum traction from buyers. Builder floors in popular trans-Hindon localities such as Vasundhara and Vaishali posted a decline of 2-3 per cent each, QoQ. Some infra projects in pipeline that could boost Ghaziabad’s overall realty include the widening of NH-24, Dilshad Garden metro extension to New Bus Adda and flyovers along Mohan Nagar stretch. Average land values in Ghaziabad stagnated replicating the overall grim realty ambience in the city. Prices of plots along NH-58 in Ghaziabad rose to the tune of six per cent in Jan-Mar 2016, as compared to the preceding quarter. Connecting Delhi and Meerut, NH-58 credits its growth to some proposed infrastructural augmentation, including widening of the highway, construction of a flyover at Raj Nagar Extension Crossing and a connector to the Meerut Cantonment. Positive sentiments in certain micro-markets along NH-91 have contributed to the three per cent rise in the prices of residential plots. The Kannauj-Etah and the Aligarh-Kanpur stretches of the highway are expected to see some renovation undertaken by the National Highway Authority of India. While the established clusters of Kaushambi, Vaishali and Indirapuram witnessed decent traction from the tenant community, the overall rental market of Ghaziabad succumbed to attractive options available in the neighbouring localities of Noida. Replicating last year’s performance on the rental charts, leasing values for apartments in Ghaziabad continued to project a downtrend. 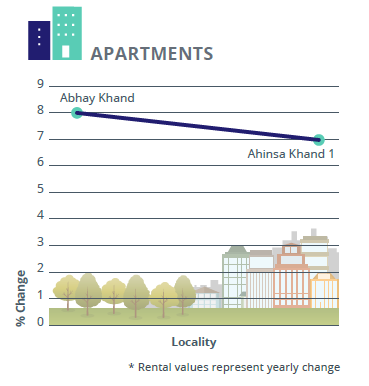 Only two sub-localities of Indirapuram – Abhay Khand and Ahinsa Khand I – recorded growth in yearly rentals, by a margin of eight per cent and seven per cent, respectively. Oversupply of apartments in Raj Nagar Extension, coupled with high pollution levels resulted in a declining rental graph of 11 per cent, YoY. Gurgaon continued suffering on account of low transaction volumes, limited number of new launches and withdrawn buyer interest in the first quarter of 2016. As a result, overall apartment values in Gurgaon plateaued in Jan-Mar 2016 after dipping by two per cent in Oct-Dec 2015. 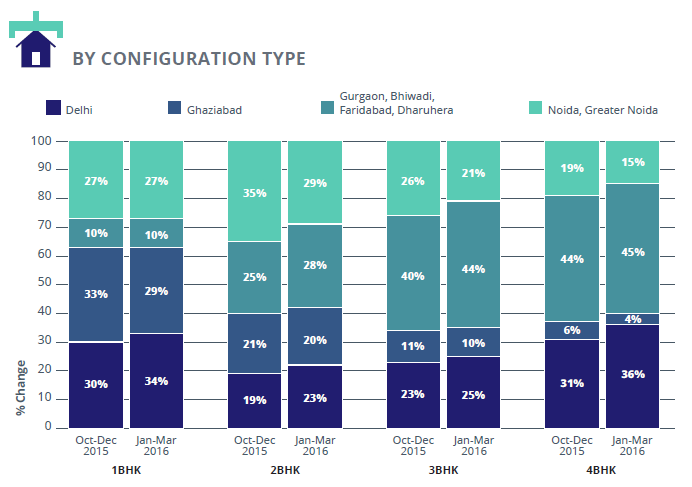 While sales were primarily concentrated in New Gurgaon and Sohna, sectors such as 108 and 110A, located in proximity to Dwarka Expressway, also scored well on the back of expedition in construction work of the stretch. The projects launched under affordable housing scheme, in the price bracket of Rs 3,500-5,000 per sq ft, noted healthy traction, while supply was predominantly concentrated in premium segment. Realty in the micro-market of Bhiwadi continued to be largely driven by the neighboring regions of Delhi NCR such as Manesar, Gurgaon and Rajasthan. Residential units in this belt are still in the affordable range, priced around Rs 2,800 per sq ft. The area also benefits from Delhi Mumbai Industrial Corridor (DMIC) and the proposed international airport. Faridabad and Dharuhera witnessed apartment prices descending by two and three per cent, respectively. However, the quasi-industrial city of Faridabad is touted to be a good investment zone on the wave of the new metro corridor connecting all of Delhi’s satellite cities. Sector 70 in Faridabad emerged as a top-grosser in the latest quarter. While the average price of land parcels in the Millennium City stagnated, certain pockets – New Palam Vihar, sectors 23 and 38 – clocked some average growth in Jan-Mar 2016 vs. the previous quarter. 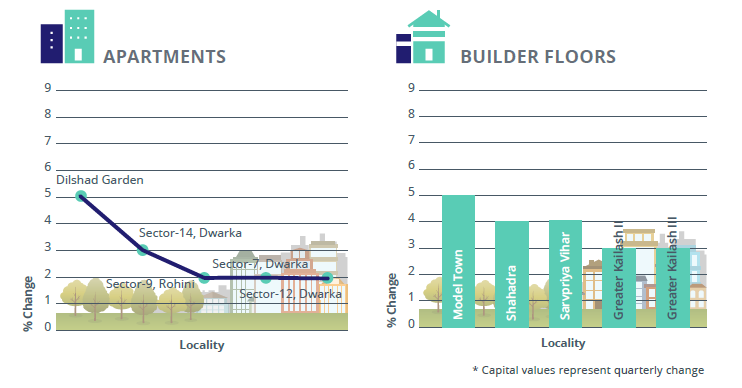 Most of the sectors in Gurgaon have either posted a dip or stagnant land values, owing to limited buyer base and competition from projects along Dwarka expressway. Average land prices in Faridabad dropped by six per cent, although Sector 62 grossed four per cent spike on the capital charts. Proposed infrastructure plans, such as the Faridabad-Noida- Ghaziabad (FNG) expressway and metro extension to Greater Faridabad, might have propelled ‘ask’ rates here. Builder floors constitute almost 15 per cent of all total property supply in Gurgaon. Narrating a similar story like apartments, average capital values of builder floors posted a marginal dip QoQ. The market succumbed to oversupply of housing units, barring a few localities such as Malibu Town, Sector 43 and Sushant Lok I, which saw prices increasing by an average of two per cent QoQ. Average capital values of builder floors in Faridabad, too, dipped marginally by a per cent in Jan-Mar 2016. Some exceptions included Sector 21D, where capital values surged by five per cent. Albeit unprecedented, it is being speculated that the sector grew as a result of the proposed metro connectivity to Ballabhgarh. While the leasing market in Gurgaon posted a yearly dip of two per cent, rental values in Bhiwadi and Faridabad stagnated in the last one year. 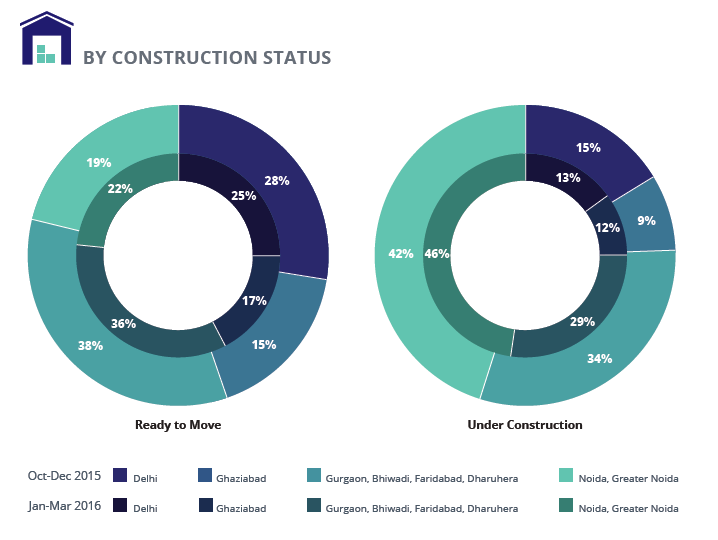 Low occupancy levels across newly developing sectors such as 73, 88 and 92 in Gurgaon troubled the market, with poor connectivity and transportation further aggravating the situation. 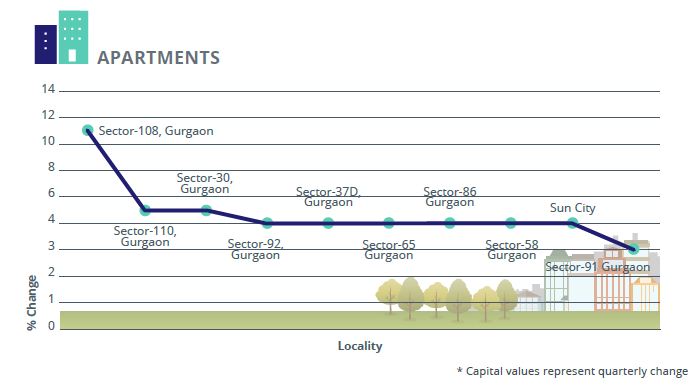 Sector 71 in Gurgaon took a healthy rental leap by 13 per cent due to proximity to Gurgaon metro and office complexes. Rentals in Golf Course Road and Golf Course Extension Road surged by 4-6 per cent YoY. The promise of improved connectivity via the rapid metro network, has lifted sentiments and demand in these pockets. 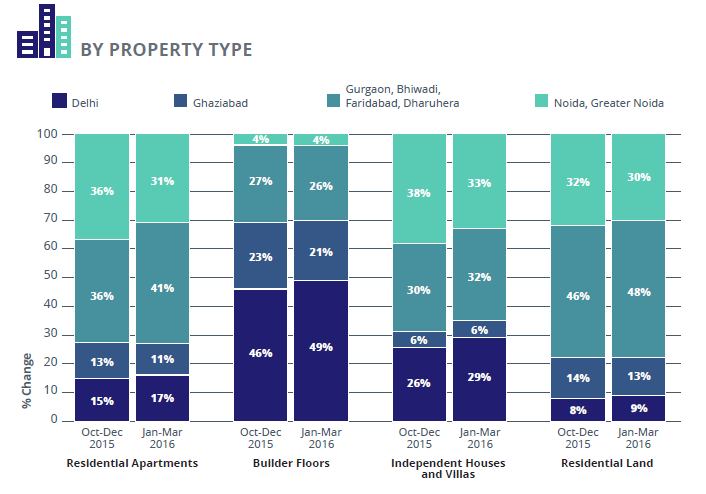 Rental values of builder floors in Gurgaon clocked a yearly average rise of three per cent, with DLF City Phase I and III witnessing the highest surge of 11 per cent each. 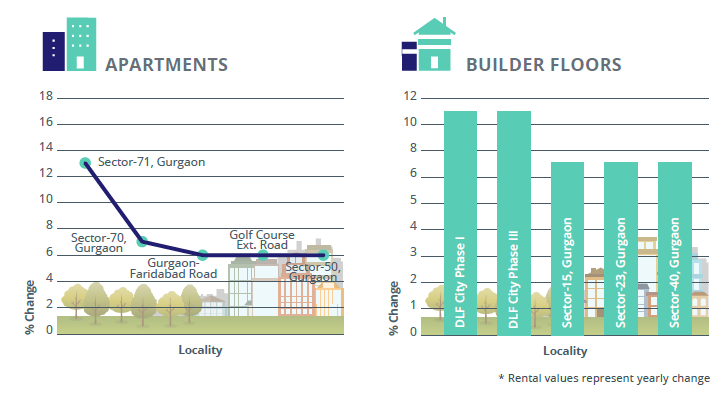 With DLF Cybercity leading office space absorption by IT/ITeS companies, it does not come as a surprise that the locales in vicinity – sectors 15, 23 and 23A – witnessed a spike in rental values by seven per cent each. Faridabad’s rental market remained as bleak as its capital landscape, and plunged by four per cent in Jan-Mar 2016, as opposed to Jan-Mar 2015. Proximity to HUDA city metro station helped Sushant Lok I score a healthy rental appreciation of six per cent YoY. 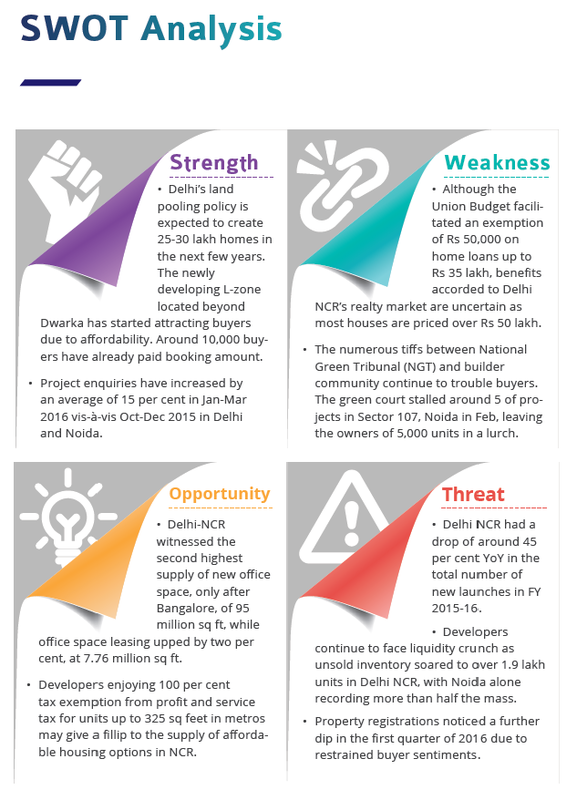 Burdened with the highest number of unsold housing units across the country, Delhi NCR remained defensive with new project launches in the first qu arter of 2016. On the brighter side, supply in affordable category has increased in tu ne with the demand. Satellite zones of Gurgaon and Noida captured the maximum share of apartments in Delhi NCR in Jan-Mar 2016. While Gurgaon, Bhiwadi, Faridabad and Dharuhera collectively constituted a little over 40 per cent of the total supply of apartments, Noida and Greater Noida followed suit, with more than 30 per cent of the apartment inventory in NCR. Limited absorption in the residential space with restricted number of new launches translated into a five per cent increase in the availability of apartments in Gurgaon. Nearly 50 per cent of the total supply of builder floor units was recorded in Delhi. Supply in this category saw a marginal rise in the quarter ending March 2016 against Oct-Dec 2015. Limited number of new launches in Noida and Greater Noida translated into a drop of three to six per cent in supply of residential units across all budget brackets. 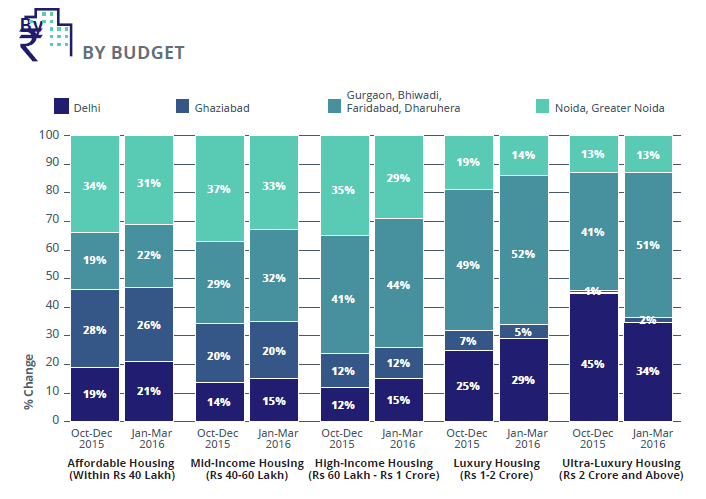 Ultra-luxury housing budget category saw a steadfast growth in every zone, highlighting a backlog of inventory from previous quarters, bearing in mind that this segment is not as popular among buyers and investors alike. Gurgaon continued to capture more than half of the total inventory in the luxury as well as ultra-luxury segments. The market witnessed a significan t rise of 10 per cent in supply of properties priced above Rs 2 crore, reflecting an inve ntory overhang. In line with the Oct-Dec 2015 quarter, the Jan-Mar 2016 quarter too saw maximum availability of affordable projects in Noida and Greater Noida a mong other zones, at around 30 per cent. However, the zone witnessed a fall of three per cent in availability of affordable homes signifying an absorption of the pending inve ntory in this segment. Across all zones, the 3BHK configuration cap tured the maximum supply at 40 per cent, while 2BHK units followed suit at 30 per cent. Gurgaon continued to have the highest supply of larger formats including 3BHK and 4BHK housing units. Noida and Greater Noida saw a significant drop of six per cent in supply of 3BHK units, accentuating a healthy absorption for this residential layout in the zone. Almost one third of the total 1BHK units available in the NCR were located in Delhi. Majority of these units were present in builder floors. Ghaziabad too recorded a healthy supply of 1BHK units with close to 30 per cent share. At around 30 per cent, Delhi seized the highest supply of ready-to-move-in properties in NCR. This could be attributed to the fact that it is largely a secondary market, with most transactions being “re-sale”. Noida and Greater Noida were largely flooded with under-construction properties, forming more than 40 per cent of this stock in NCR. Majority of the under-construction properties in Delhi NCR were priced within Rs 40 lakh, underlining the importance given to the development of affordable housing segment.